Tell the universe what you want. Tell a friend. Tell God, too. Tell yourself. Write it down on a list. Be clear and forthright about what you need and want. Talk as if you were talking to a friend. That is not control. That is learning to own your creative power—power to help create your life. Then let go. Do not stand tapping your foot, impatiently waiting. Simply let go, the way you would if you trusted your friend to respond positively, in a way that was best for you. Go naturally about the course of your life. Listen to your heart. Listen to your inner voice. What you are guided to do, where you are guided to go, where your attention is directed, the people you meet, the phone calls you receive, the experiences you have—even the problems that arise—these are some ways the universe can respond to you. Open your eyes. Look around. 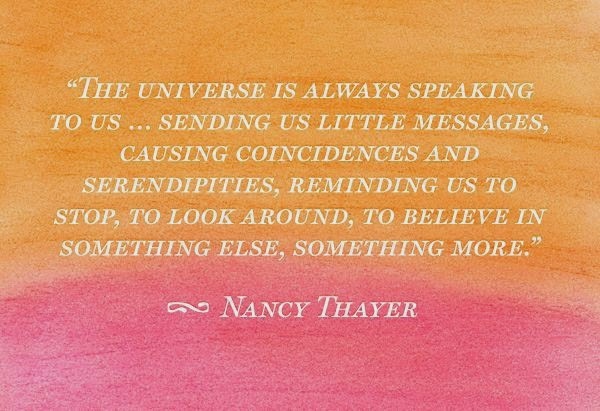 See how the universe responds. Watch how it dances for you, with you. You are connected to a magical loving universe, one that will come alive for you, dance for you, in ways you cannot imagine—but in ways you will come to know as true. Look within, too. Sometimes the most gentle, quiet, flickering thought— that glimmer of an idea, that awareness of a need or desire, or that small bit of inspiration or intuition—is how the universe prepares use for what it wants us to do or receive. Our inner voice, the one in our heart, is an important part of the way we're guided and led down our path. You stand at a gateway now. It's the door to universal love."